All hand blown glass vases are designed by me (Rich Small), but made by hand with the help of Ben or Diane or Morgan or Jon. Each glass vase is signed by me and dated. 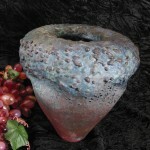 Each vase is unique, as you will quickly see when looking at the pictures. All are about 12″ tall, unless otherwise noted. 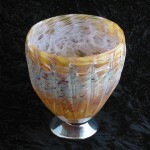 If you would like to buy one of these beautiful works of glass art, contact me via email with the # of the piece. If you’re just browsing, be sure to click on the thumbnails; they all expand so you can see detail. And if you’d like to get on my mailing list, send me an email and I’ll add you (I will not share or sell your email address, and I don’t send out many emails, so you won’t be inundated).